Before installing a weld camera, welders are often perched at unsafe heights, giving them a poor view of their welding activities. Many welding activities are done at unsafe heights, while the welder attempts to monitor and control the welding process. The moving machinery around them forces them to work in small, constrained working areas- which is often dangerous and uncomfortable for the operator. In these conditions- behind a helmet and perched above the welding process- welders miss important details in the welding arc, which can lead to mistakes and inaccuracies that are costly and timely to fix. Not only are these conditions a safety risk, but they make it harder for welders to ensure that they execute a high quality weld. Xiris Automation weld cameras enable workers to perform a weld without leaving the ground. 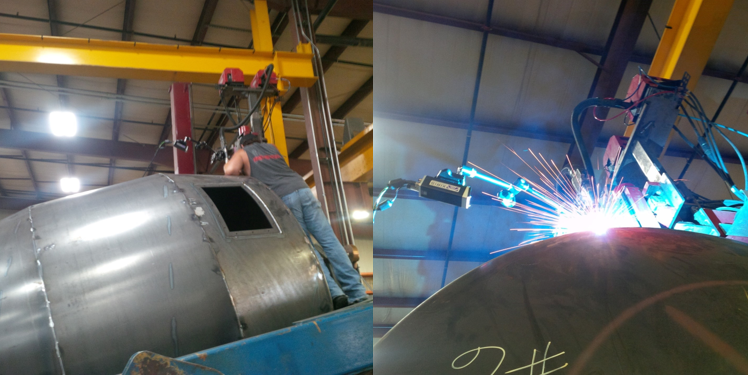 Our solutions give welders a consistent image quality regardless of the angle of the weld. They can view multiple images of the weld from leading, trailing or side views of the weld process. Don't pay for accidents, prevent them using machine vision technology. If you are interested in learning more about our company and products, please contact us here. “Welders, Cutters, Solderers, and Brazers.” U.S. Bureau of Labor Statistics, U.S. Bureau of Labor Statistics, 13 Apr. 2018, www.bls.gov/ooh/production/welders-cutters-solderers-and-brazers.htm#tab-3.